Researchers In the Aerosol and Cloud Lab at MIT are perfecting ice cloud chamber methodology for future generations. A new instrument, the SPectrometer for Ice Nuclei (SPIN), will ultimately clarify how humans are changing the chemistry of the atmosphere. Clouds are one of the largest sources of uncertainty in the climate system. While clouds shield the planet from incoming sunligt, they also trap heat trying to escape from its surface. In general, clouds are thought to profide a net cooling effect to Earth. Complicating their behavior are tiny airborne particles called aerosols, such as soot, sea salt, mineral dust, or black carbon, which can act as seeds on which water vapor condenses to form clouds. At very high altitudes, water vapor can freeze around aerosols, creating ice-containing clouds known as cirrus. Lab experiments suggest that mineral dust from land use, metal oxides from industrial smelting, and so-called “fly ash” from coal combustion are excellent at seeding ice crystals. However, researchers can’t say how aerosol-releasing human activity influences the formation, reflectivity, or persistence of ice clouds up in the sky, largely because of a lack of measurements. The holy grail of ice cloud microphysics--field observations that help constrain the number, size, and frequency of ice-nucleating particles in the atmosphere—currently only happen at the handful of research labs with an ice cloud chamber. What’s more, ice cloud chambers tend to be built from scratch in separate labs, and measurements from one may not be comparable to those from another. Clearing away that fog is the new SPectrometer for Ice Nuclei (SPIN). A company called Droplet Technologies in Boulder, Colorado recently chose SPIN out of other home-built models to license and manufacture as the first commercially available ice cloud chamber. Serial number 001 sits in the Aerosol and Cloud Lab at MIT, where researchers led by atmospheric scientist Prof. Dan Cziczo are developing a standardized methodology for the model’s future widespread use. “It’s important to characterize SPIN’s behavior and figure out how it works, so the instrument can eventually be used as a ‘plug-and-play’ type of deployable instrument that can provide ice nucleation measurements from around the world, in the field and on airplanes,” says Sarvesh Garimella, a PhD student in MIT’s Earth, Atmospheric, and Planetary Sciences Department (EAPS), who recently presented SPIN at the American Meteorology Society’s 14th Conference on Cloud Physics in Boston. The SPIN, a 2-meter tall metal box on wheels, contains a sealed chamber in which researchers can adjust the temperature and relative humidity to create perfect conditions for the formation of ice crystals. After the aerosol of choice is pumped into the chamber, the stream passes under a laser beam, counting how many particles nucleated ice crystals and how many didn’t. The study of warm low-lying clouds has a 15-year head start on ice cloud science. The first warm cloud chamber, the Cloud Condensation Nuclei Counter (CCN), entered commercial production in 1999. Now, every field site has one, allowing researchers to monitor the potential for warm cloud formation in a region. “This set-up has improved our understanding of what aerosols are and aren’t important in warm cloud behavior,” says Dan Cziczo, Associate Professor of Atmospheric Chemistry in EAPS. “This is partly because the CCN became commercially available, but also because the folks using the instrument paid a lot of careful attention to the methodology, and future generations did the same thing.” Cziczo, who helped create the SPIN as a researcher at the Swiss Federal Institute of Technology in Zurich, hopes to achieve the same result with the ice cloud chamber. With funding from MIT International Science and Technology Initiatives (MISTI), the Cziczo group recently travelled to the Leipzig Aerosol Cloud Interaction Simulator (LACIS), a state-of the art cloud laboratory in Germany, to perform an instrument validation. There, they meticulously compared results from SPIN 001 and two other SPIN models (there are now 5 in existence). Sarvesh Garimella is now working with engineers at Droplet Technologies to implement fixes to several issues unearthed during the tests. “We really feel like we have a responsibility to the people who will do ice cloud research in 5, 10, or 15 years, so we spend a lot of time getting the methodology right,” says Cziczo. Garimella, for one, isn’t waiting years to start shrinking one of the largest error bars in climate change estimates. Once he sees SPIN through its validation process, he will make the first measurements of the ice-nucleating properties of fly ash. He wants to tease out the effects that fly ash, and anthropogenic aerosols in general, have on ice clouds. In fact, he notes, the presence of fly ash could increase or decrease ice cloud longevity depending on factors such as the amount of water in the air mass. With the lab data, Garimella intends to create a model framework of the mechanisms of fly ash-cloud interaction. He envisions pushing that code into global climate models, which currently lack realistic representations of how clouds behave. Dan Cziczo is an atmospheric scientist interested in the interrelationship of particulate matter and cloud formation. 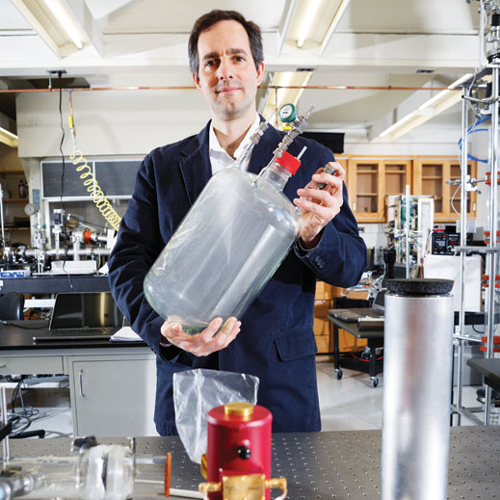 His research utilizes laboratory and field studies to elucidate how small particles interact with water vapor to form droplets and ice crystals. Cziczo's research group focuses on Earth's radiative budget, meteoritic debris, vehicles emissions, and the effect of atmospheric aerosols on cloud formation mechanisms. He holds a bachelor's degree from the University of Illinois at Urbana-Champaign, and a master's degree and doctorate from the University of Chicago. Cumulus, Cirrus, Stratus: What Clouds Say About Climate Change In this video from the MIT Alumni Association's Faculty Forum series, Cziczo discusses the connection between clouds and climate change, and the impact of particulate matter and aerosol particles.